My husband is a stud. There I said it. What now, you ask? 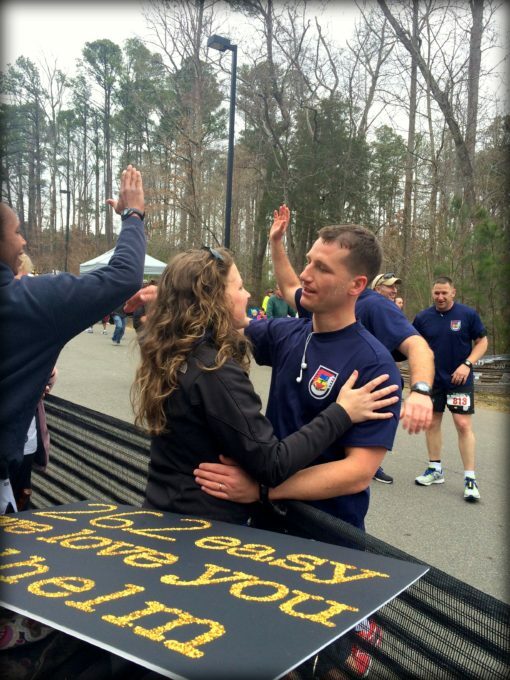 Oh nothing really…he just completed a marathon this weekend!!!! If you had asked me during the train up (you know- all those Saturdays when Andrew was gone for 2-4 hours at a time on long runs) if I was a fan of “the marathon,” I would have given you this answer: No. But on Sunday morning, I found a new and very great appreciation for people who put their minds and bodies through the exertion of a marathon. Watching each runner cross the finish line- exhausted but elated, broken but so high- was nothing short of awe inspiring. And then I saw my husband cross with his two fellow paratroopers, and I about burst into a thousand pieces of proud. I was screaming at the top of my lungs. I was waving my sign high. Tears welled in the corners of my eyes. 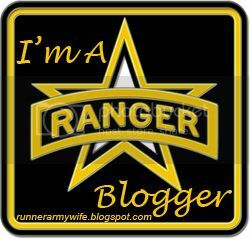 I watched him shake the hand of his brigade commander, then find us in the crowd. “I am so proud of you,” I told him as I threw my arms around him. “It was harder than I thought it would be,” he said. I kissed his salty lips and smiled. 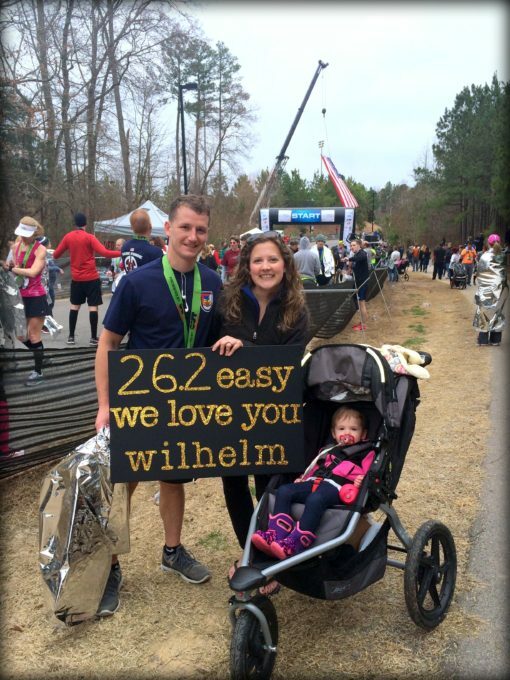 My husband ran 26.2 miles. 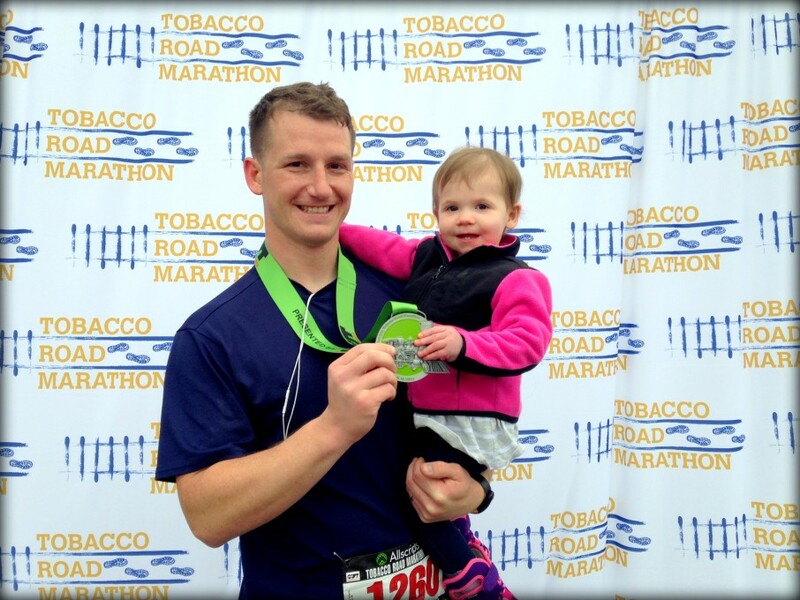 The Tobacco Road Marathon. The bar has been set. The farthest I’ve ever run is 5K. What is your greatest distance? Are you a marathon maniac? This morning I opened my eyes and thought, “Wow, I really do NOT want to run. Like 0/10.” Then I checked the weather on my phone – 79 degrees by 8AM. Awesome. (I have a personal rule that I do not like to run in temperatures above 74 degrees. Above 74 degrees is sweatfest USA, no matter how hard I’m working, and I am just not that into that.) Then I remembered I haven’t run in five days (resting my knee after falling down a hill with dog and stroller). Then I got up and put on my running clothes. The first mile was terrible, but the podcast I had picked was about coming back after an injury, and the ladies were talking about how the first mile always stinks, but then you find your rhythm. So I pushed through. Mile two was better, but I was running into the wind and felt like I would probably be faster if I was just walking. I was watching my shadow barely making any progress and trying to convince myself I was really going much faster than her. By mile three I was almost home but still had more time to make up, so I took took a couple extra loops on blocks close to my house. They were all uphill and into the sun. I need my favorite iPhone emoticon to insert here…the first grade smile. By the time I made it to the five minute cool down, my face was purple, I was sweating enough to fill up Maddie’s water table for this afternoon and I was praying all of my neighbors stayed inside their homes and did not try to engage me or I would collapse at their feet- not because I had to (I felt pretty okay), but because I’d have to commit to the bit at that point and at that point I was a HOT MESS. I did 2.83 miles in 30 minutes of running (10:35 miles) and .56 in 10 minutes of walking. I logged my best total distance to date. My knee felt good. So I’m back in the game. Does anyone have good strategies for getting over the mental hurdles you face while running? Do you pretend you’re being chased? Do you cry, “Run, Forrest, RUN!” over and over in your head? Do you hum Chariots of Fire while pretending to carry the Olympic torch? Sometimes I call out to Madeline and tell her she’s killing it! Doing an awesome job! And then she does some unimpressed yell that fuels me to keep going. What are your pro-tips? Probably about 11/12 weeks ago I started Couch To 5K…again. 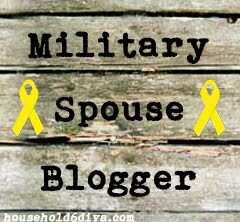 The last time I did this it was during Andrew’s deployment. I committed to the nine week program with my sister and her husband, and we cranked it out. I was toned, skinny and feeling great. Then Andy came home, we ran a 5K race that weekend and I hung up my sneakers. Running wasn’t for me. I never felt the runners high, and I never felt like it got any easier or that I got any better at it. Fast forward two years, a pregnancy, and a baby. At about nine months post-partum, I felt ready to run again. Although I was back to my pre-baby weight, I didn’t look the same at all. I knew the results I’d had the last time I completed C25K, and I wanted that rockin’ body back. So I did what I do- went out an bought new sneakers, new running clothes and a new running stroller (The BOB). And I started training. So far during my training I have endured a strained Achilles (I started with a poor shoe choice – took a week off and got fitted for another pair of new shoes at a running store), a strained hamstring (ran a 5K race with my husband at the mid-point of the program, before my body was fully capable – took a week off) and now a sprained knee (I fell down a hill while pushing Maddie in a stroller and walking Hudson). The latest injury has stalled me at the final week of the program. This has been a frustrating couple months. I make progress, get injured, take a few steps back, gain new ground, get injured, repeat. My body has NOT gone through the huge transformation I was expecting. Although my husband tells me my legs look leaner and stronger, I don’t see it. The extra weight in my mid-section has not miraculously melted off (along with my stretch marks), as I had hoped it would. Plus I am full of guilt. I keep thinking that I look like such a shammer trying to rest an injury. Or if I skip a run one morning for whatever reason, I beat myself up, making excuses to myself, rather than just enjoying the rest. “I’m going to run tomorrow morning. I was so tired. I really need the break.” This hasn’t gone down how I thought it would. However, I am enjoying being active again. I feel like I am setting a good example of what a healthy, active lifestyle looks like for Madeline. I feel proud when I return from a run, having gone a little farther or a little faster than the previous run. And I have found a way to make it through my runs without spending every waking minute wondering how far I’ve gone or when it will end. I listen to podcasts, specifically the Another Mother Runner radio show. The thought of getting to run while listening to a new show actually excites me. Excited about running. Me. That thought alone put a smile on my face. I am a badass mother runner! So although it hasn’t been easy and I may not be toned or skinny, I’m going to keep going. When I feel healed enough (do we ever? ), I will finish my final week and then I will continue to run. Because, as it often does, the good outweighs the bad. Can I get an Amen?